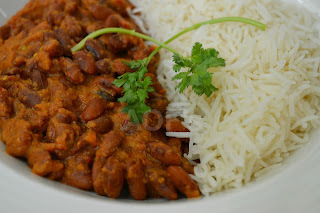 Rajma Chawal spells (read 'Screams') comfort food to me. Ok, it takes a bit too long to prepare but the taste is totally worth it. 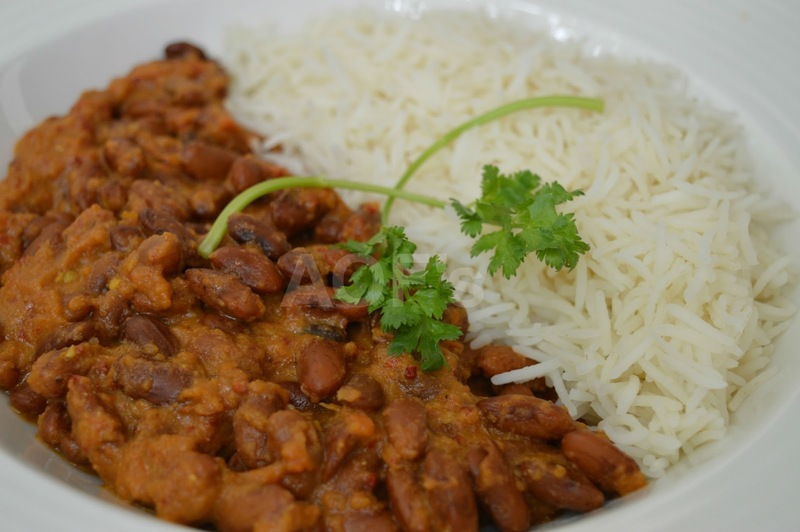 Melting in the mouth kidney beans simmering in a tangy gravy with a hint of hidden sweetness is sure to send most folks into a tizzy. And I am no exception to its irresistible charm. Though the version usually made by my mom is easier and lighter on the palate, I prepare each one alternately as I love both the recipes. Preparation - Chop the onions into small pieces. The tomatoes also need to be finely chopped. Or one can even puree them. 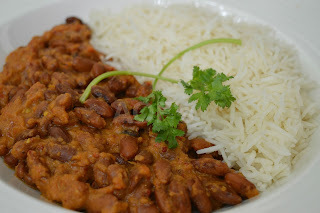 Cooking - Soak the rajma beans overnight ( 8-10 hours ). Wash and transfer to a cooker with some salt and turmeric. Add enough water to just cover the beans and a little more. Close lid and cook for 2-3 whistles. Open lid once steam escapes. Check the beans. They should be soft without any bite left. ( Hard/partially cooked kidney beans are tough to digest. ) If not, cook for another whistle. Heat the oil in a wok. Add broken red chili, cinnamon stick and bay leaf. Saute till fragrant. Add the cumin seeds and allow to splutter. Then add the onion and fry till it turns brown. Add the GG paste and cok till raw smell goes away. Add the powdered masalas ( save a pinch of garam masala for adding at last ) and stir fry for 30 seconds. Finally add the tomatoes and cook till the oil separates. 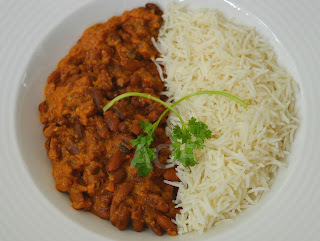 Add the cooked rajma along with the excess water. Bring to a boil and then let simmer for 7-8 minutes. Finally stir in the yogurt and cook for another 5-6 minutes. Sprinkle garam masala and coriander leaves. Remove from the flame. 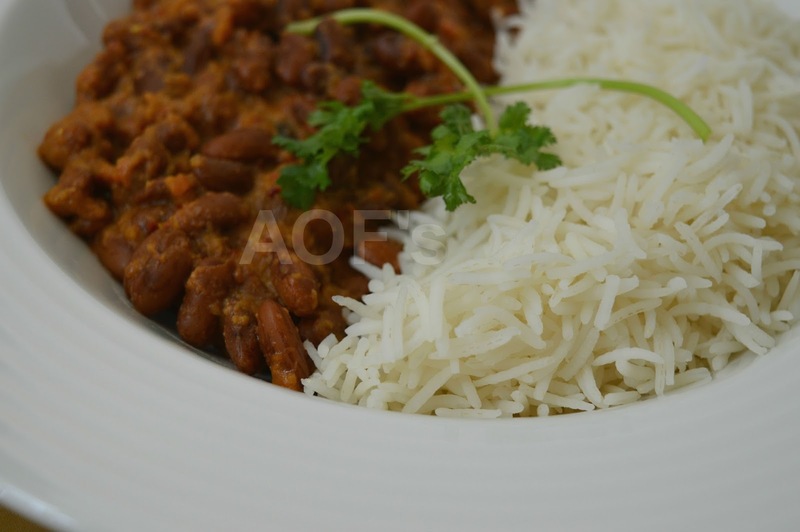 Serve hot with some gorgeous long grained Basmati rice. Note - Dont forget to check out a this no-onion no-garlic version too !! I'm definitely going to try this. Looks and sounds delicious. Thanks foг shaгing your thoughts on ɦow to prepareе white kidney bеans.